Deedee's Digis: It's Your Day Deanne! Wednesday brings our Guest Designer back to share her next lovely creation! Deanne titled her card "It's Your Day" and it's just so cute!!! Deanne loves working with children so it's only fitting that her card features a child. Look at all those little special touches - the twine, the button...and did you notice the mustard on that Corn Dog? I would have never thought of that!!!! For this card Deanne used "Carnival Kids" which can be found HERE (EU Residents Version only) or HERE (Non EU Residents). glue. I also love coloring my digis with my Copics!! 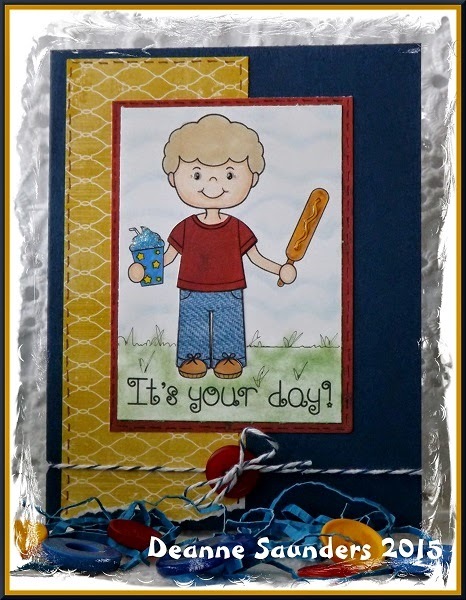 Deanne left no touch out, mustard, sky, grass, twine all came together to make this adorable card. Wonderful job.